The Nook Pod, created by the Do Company, is a workspace collaboration unit. There are a number of uses for the Nook Pod and this is its biggest use, with many being utilised at Events and in offices. 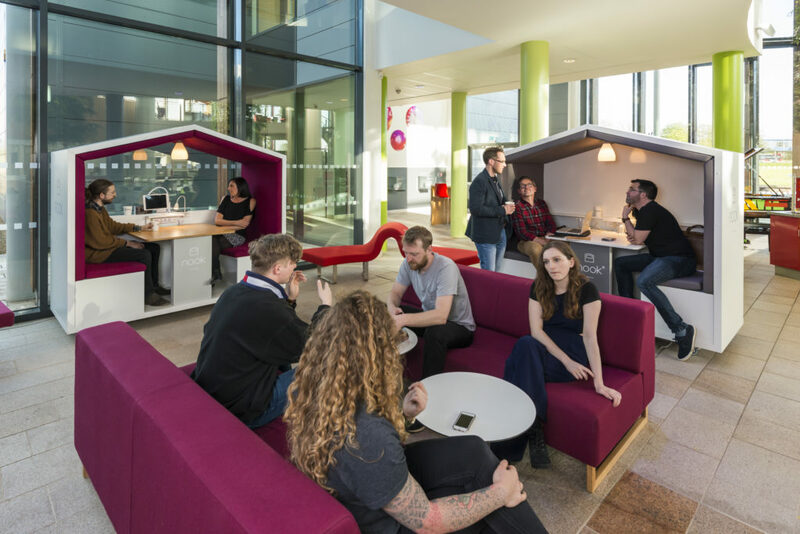 The aim for these workspaces is to provide an efficient and flexible space to create greater engagement between people. Through research, it has been shown that collaborative workspaces are much more beneficial than standard office spaces as they inspire creativity, further an individual’s goals, create a supportive environment, combine complementary strengths and promotes sharing of knowledge (SOURCE: https://bit.ly/2QtRXO8). The Nook Pod is built in a way that allows it to be incredibly adaptable with a variety of configurations available. The roof design creates an intimate space and enhances the quietness and sense of privacy that some workspaces may not have. 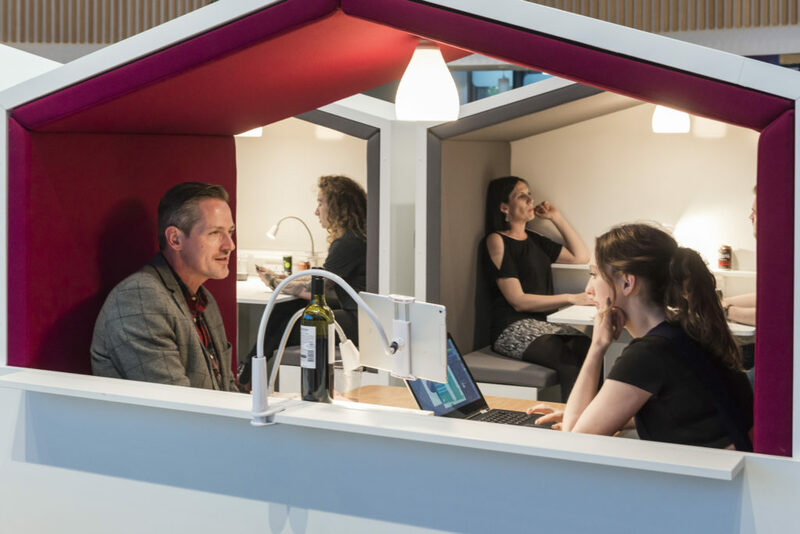 Whether the meeting involves two or ten people, the pods can be arranged in a way that provides the space you need without losing any of its benefits. As well as having the modular pods, any technology that is integrated into the space is modular also. If you want to find out more about the technology that can be integrated into your Nook Pod, please send your details to us by filling out the contact form below and we can send an overview to you. The Nook is ideal for enhancing the wellbeing and productivity of its user. Below are some examples of what the Nook can be used for. Meetings: When you think of a meeting room, it is usually a large office space meant for large gatherings but the space can sometimes be in short supply. The Nook creates a space for smaller meetings where a more intimate and innovative approach is required. Depending on how small or large your meeting needs to be, the Nook can be configured to suit all. If you are looking for a small meeting space where only one or two people will be involved then a single unit will work perfectly, however, if the meeting requires more space then additional units can be combined. Educational Purposes: The varied configurations allow for private study or group discussions and are designed so that they can be placed almost anywhere whether this be in a library or in a canteen. The possibilities are almost endless. Check out how the University of the West of England are using it here https://bit.ly/2RDk0fv. Events: The Nook is already being used at many events as they allow guests and hosts to connect and network with one another in a private and comfortable space. With branding options available, these spaces are a great way to promote your brand and advertise via internal or external screens. What’s next for the Nook and Channel Tools? Look out for the technology that will be integrated within the Nook over the next 12 months! We will make sure to keep you posted. If you are interested in The Nook, please do get in touch either by calling us on 01923 299 629 or email bryony@channel-tools.biz. Alternatively, fill out the contact form below.